College Of Fisheries, AAU Raha Recruitment 2018 September | Computer Assistant Post :- Assam Agricultural University has again published a new recruitment notification in September 2018. According to the latest AAU Raha Recruitment 2018 , a walk-in-interview will be held on 28-09-2018 at 10.30 AM in the Office chamber of the Dean,College of Fisheries, AAU, Raha to select a candidate for the following post on contractual basis initially for 6 (six) months. 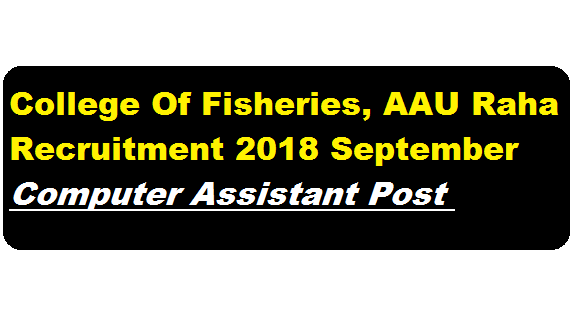 In this section, we will discuss in details about the recruitment of Computer Assistant Post under College Of Fisheries, AAU Raha Recruitment 2018 September with vacancy details, eligibility criteria, salary with other details and requirement. Age Limit : The maximum age limit for the post in 36 years as on 1st Jan 2018. Essential Qualification : Candidates must have done BCA/ B.Sc.lT/ B.Sc. Computer Science from a UGC recognized university. Salary : Rs. 10,500.00 (Fixed) per month. Interested and eligible candidates may attend the walk-in interview. The candidates shall have to submit their brief bio-data along with attested copies of relevant certificates in support of their age, educational qualification and experience etc. in addition to production of original testimonials at the time of interview.